Don't worry, not gonna bore you with report-duty details. Just to keep a record, and show off my boys. 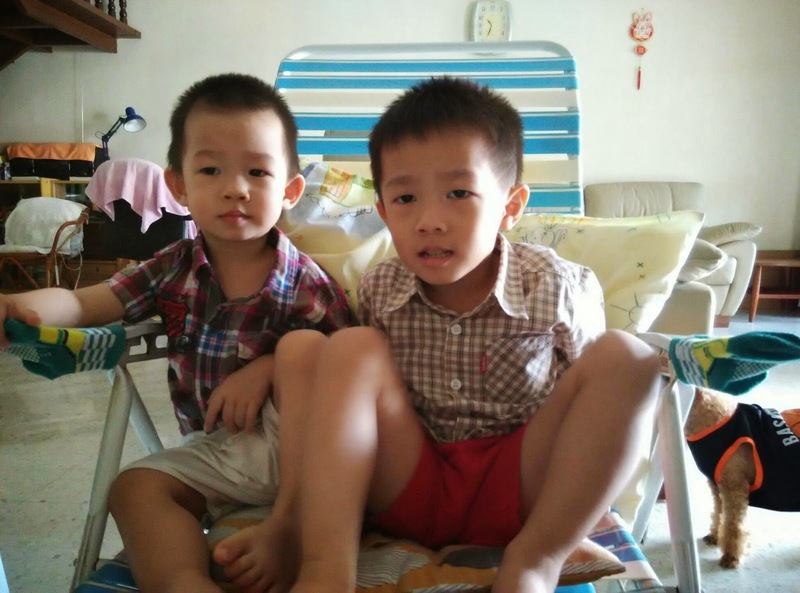 Chor 1 - Went to mil's house in the morning, visited a relative after that, went home for the boys to nap, back to mil's house for dinner. Done. 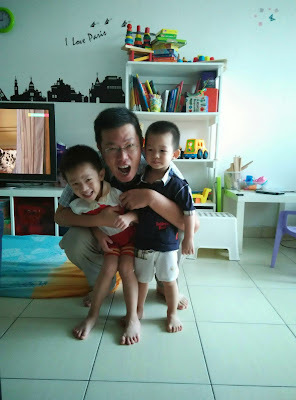 Chor 2 - Went to my parents' place for lunch, back home for the boys to nap, then to my mil's place for dinner. Done. *Psst, please ignore the dog at the back. Chor 3 - Hosted a mini gathering for the in-laws. They came around 12pm, left around 7pm. I cooked - roast chicken, cream sauce spaghetti, potato-egg-bacon salad and cheesecake for desserts. Then they gambled whole day. After they left, I vacuumed and mopped and washed the toilets. 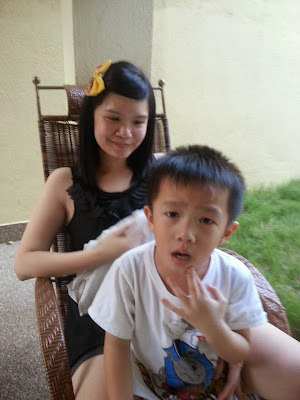 Chor 4 - Went to visit hubby's boss in Klang, and stayed home after that. Done. 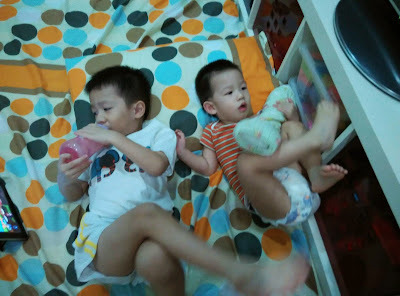 Chor 5 - Sent the boys to the daycare (yep, they opened already), while me and hubby went shopping and paktor, yay! Took this photo after we got back from the daycare. Chor 6 til 9 - Start work already, nothing much to report. Everything back to normal, go to work, come back, tapau dinner, sleep. Chor 10 - Steamboat at my sil's house, so this was taken at their living room. A few minutes after taking the family photo, Kz ran around the house and slipped and fell and knocked his head. Look at his "bungalow" (hou mou lau). Ouch !!! I quickly applied some tea tree oil, and the bump subsided after a while, phew! Chor 11 - Resting and relaxing at home is the best. Nobody cares if I walk around naked or fart loudly while cooking. Chor 14 - Last day of CNY. Boiled soup the night before (Chor 13), and "lou tong sik farn" (rice with soup) only for dinner on Chor 14. 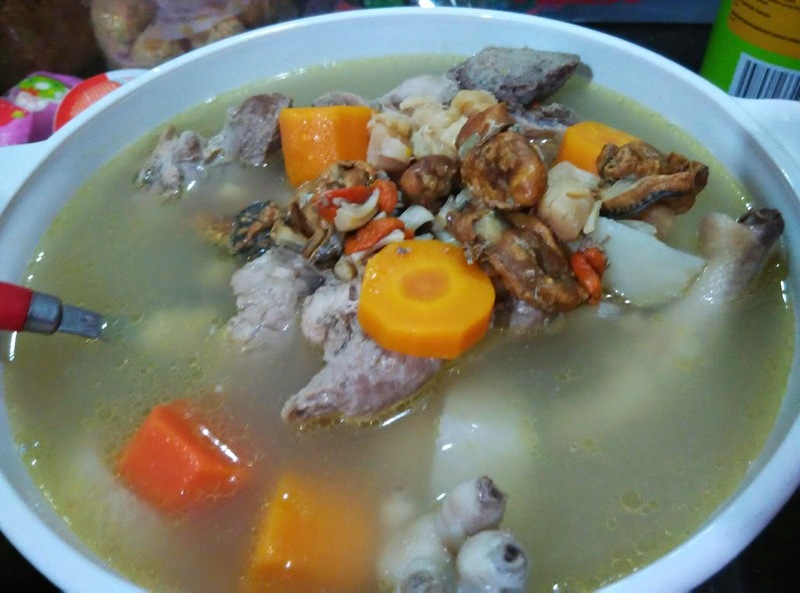 Soup ingredients: Pork ribs, chicken carcass, white radish, carrots, wolfberries, red dates, dried oysters and dried scallops. of course I am not going to dissect and comment on each single day lah.. looks like your CNY is purely house visits and then go back home to sleep lor.. but then that IS CNY lot really, nothing much to do one la.. I alao stayed at home until growing mushrooms jor lor.. haha!! Aiyoh, don't be so straightforward la.. Although it's not report-duty, but it still sounds like report-duty hor, hehe..
Yep, CNY to me is another ordinary day la.. Just that we don't have to go to work, and terbalik, have to go visit people.. Hubby says it's very tiring actually, driving in out up down, and in between have to think of the boys, coz they need to nap.. Their meals too.. Can't be feeding them boxed soya bean and ngaku chips (in people's house) all the time.. I actually gotta start work on the 5th day, but I took one day leave to go paktor with hubby.. Coz hubby very susah take leave one la, so "nan dak" he start work on 8th day, I ma take one day off to kaikai with him lor.. eih!!! just realised I am the first to comment woh, haha, really rare.. actually am bloghopping while commuting to work in the train mah.. so as usual lah, in order not to waste time I always take the opportunity of this 30 minutes to tuk tuk tuk on my phone geh.. bcos once go back to office, very hard to say if got time to even read blogs or not mah.. Ever since getting married, my CNY very routine too.. MIL's house, a few close relatives, back home for the kids to nap, MIL's again, my mum's house the next day, hubby's boss, that's about it.. Your ABC soup really hou liew leh! You always said mine hou liew, I think lose to yours one lah..
Eh baby, not abc soup ler, it's pak lobak with carrots.. But I know la, if we see carrots inside, automatically think of abc liao..
One of my favourite meals is to "lou tong sik farn" also! Oh yes, I like lou tong sik farn coz it's easy and simple too..
G had grown quite a lot and so had Kz! Alamak, Kz fell down pulak. Your CNY more activity than mine. Eh, no photo of the food your prepared on chor 3? Your soup is very nice with a lot of liew! No pictures wor, that day was really hectic.. Kept wanting it to be over and everyone leaves so that I could mop the floor, hehe..So, no mood to take pictures..
Hey, your hubby looks a bit like Hayley's. Brothers? Your smaller boy looks like you, older one like the dad. No, no not brothers, hehe.. Oh yes people also say small one a bit like me, and big one exactly like the father..
Haha thank you for your compliments.. If you zoom clearly got fine lines and big pores, ouch!! wah ....so nice ! This is the CNY I like, by visiting relatives and it will be perfect if got firecrackers too! 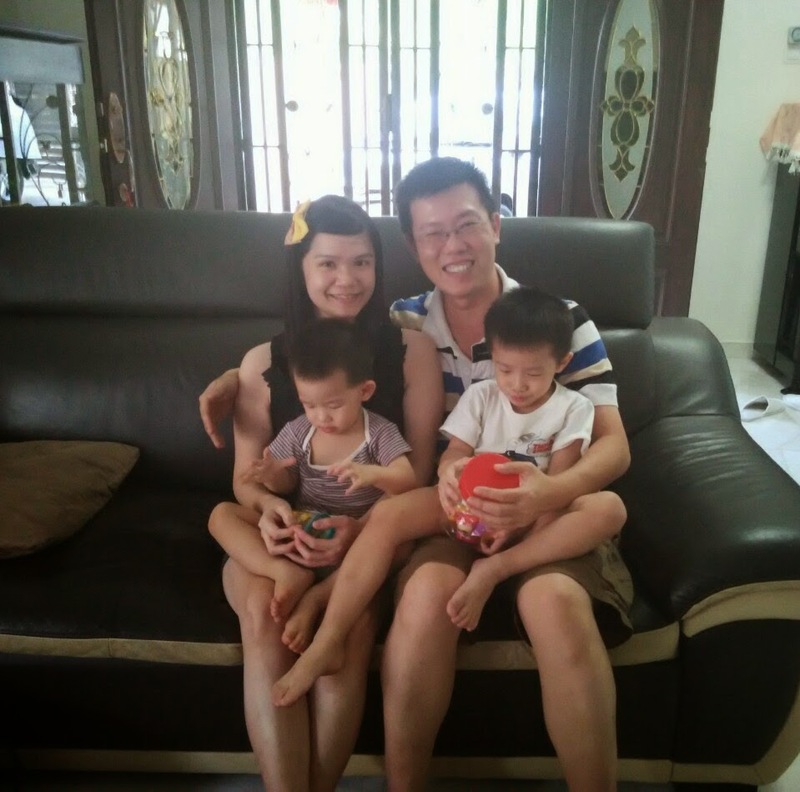 I miss those days, Nowadays, I stayed at home during CNY as my dad is the most senior. Relatives comes and visit. Oh ya, the senior sibling, normally ppl will go and visit.. Same here, thats why we just stayed at mil's place whole day, coz ppl will come visit..
the swollen bruise at ur son's forehead is so scary leh...reminds me of my childhood when i slipped and fell of the moving escalator...Well, nothing serious, but the the pain is unbearable, haha! Ur CNY happening also la...at least u got chance to go pak thor while kids are away for a few hours! Oh yes, that hou mou lau was scary.. The bump was so huge and 'tat chut lei', like a rock.. Lucky tea tree oil did wonders, and the bump subsided.. We monitored for fever and vomitting within 24 hrs, lucky alright..
Hi darling, the bump is ok already, subsided on the same day when we applied the tea tree oil.. Monitored for fever or vomitting for 24 hours, lucky alright, phew.. Yes, both sides also KL lang.. No balik kampung thingy.. So it's like an "everyday" thingy, coz we go mil's house and my mum's house quite often also every week..
if at home, no visitors, can relax with my ngaku chips and shandy, with just my house dress, can fart loudly, nobody cares, haha.. I must repeat what others have already said here. You really look like a big sister to your sons. How nice! I like how you spent CNY - with your loved ones and somedays can relax at home. You are really hard working, washing toilets and cleaning the house immediately after your in laws visited you. Thanka mun for the compliments.. I have mild ocd, actually when they were still here, I secretly already wishinh they will faster leave in my heart, coz I wana mop floor! haha..
Not really eventful.. Most of the time to mil house only.. Just like ordinary day to me cos we are both local.. Okay mah, you every Chinese new year also got stuffs to do, if me not go travel, I will be just stay at home everyday only, hahaha!! 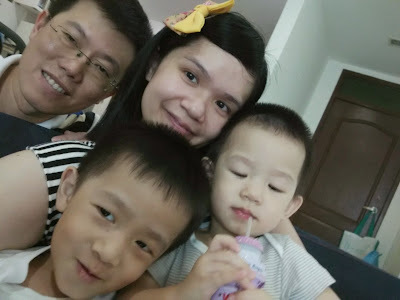 Before having kids I also go travel during cny every year ga, now no more, sobsss.. Finally CNY is over. This year I didn't do much reporting. Getting lazy now..hehe. I'm getting lazy too, to be honest, nothing much to write and struggling, haha.. Your CNY outings were relaxing and well phased out without exhausting everyone. Pandai nyer Princess! Your boys suddenly looked so big now and no more cry babies. I feel so damn old lah! Sobs! Sobs! Haha, TM, you are using SK's tips to apply here ahh? Good, makes me think of SK now.. Yeah, when kids are big, means we are old already la..
Princess Ribbon, at least you have blogged about your CNY. I still haven't done mine. May be I will summarize in one post like you. Hahaha! You really wearing ribbon all the time la! Love that you always have a ribbon in your hair! Much cute.